Food Network’s Tyler Florence is one of my favorite Food Network chefs. His recipe for caramel popcorn is perfect for a movie night, girls night in or just a little sweet snack! 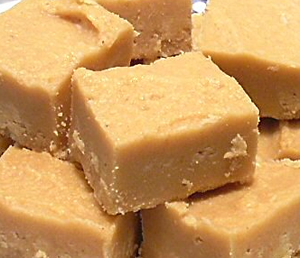 Bring to a simmer over medium heat, stirring frequently with a wooden spoon to dissolve the sugar. When thesugar syrup reaches a boil, stop stirring and swirl the pan around over the heat so it doesn’t burn. Remove the caramel from the heat and stir in the marshmallows. Fold the marshmallows into the hot caramel so they all melt into a gooey caramel sauce. 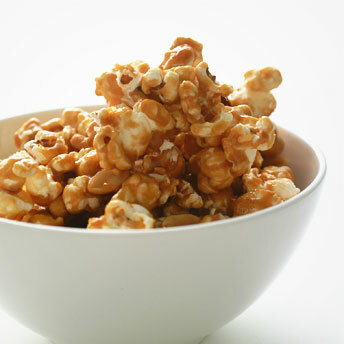 The caramel will coat better if the popcorn is hot, so make it while boiling the sugar or pop it first then keep it warm. 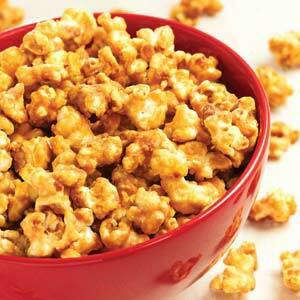 Put the popcorn in a big bowl and pour the caramel marshmallow mixture over thepopcorn. Gently fold with a wooden spoon to coat each kernel. If you want to make this into popcorn balls, grab handfuls of the popcorn and squeeze it together to form popcorn balls; make them about the size of a tennis ball. Put the popcorn balls on a sheet pan lined with waxed paper to cool completely. If not, just spread the popcorn caramel mix onto a baking pan lined with wax paper and let cool then break into pieces. Another tasty popcorn recipe! This coconut- almond recipe has some of the same ingredients as the Mexican Chocolate Popcorn Balls and is just as delicious! Coconut is one of my favorite flavors! Bring corn syrup, vegan butter, cup confectioners’ sugar, mini marshmallows and water to a boil in a large pot over medium heat, stirring. Add almond extract and a pinch of salt. Remove from the heat; using a rubber spatula. Stir in popcorn until coated. Roll popcorn balls in toasted shredded coconut. Don’t want to make popcorn balls? No problem. Instead of rolling the popcorn mixture into balls, spread out onto a baking pan and sprinkle shredded coconut on top. If your coconut it not already toasted, preheat your oven to 350ºF and place popcorn mixture with coconut on top into the oven until the coconut is a nice light brown. Food Network has great snack recipes that are easily adaptable to be gluten free/dairy free! The other day, I came across some great popcorn recipes and I thought HEY! I’ll do a little popcorn series! It first started with the Peanut Maple Popcorn. 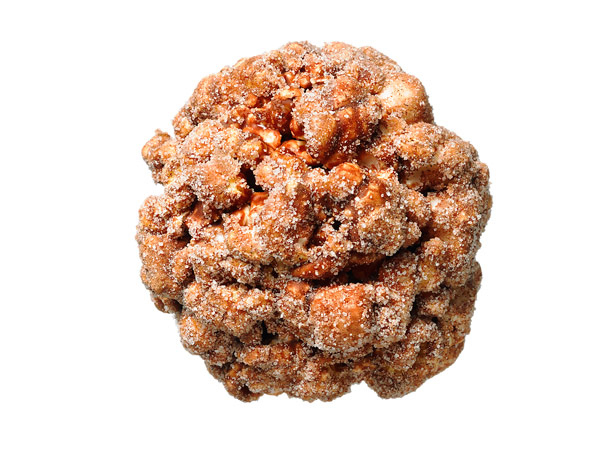 Today – Mexican Chocolate Popcorn Balls! Movie night snacks will never be the same! Making these will be sticky but worth it! The mix of chocolate and spices is great! Bring corn syrup, butter, sugar, 1 cup mini marshmallows, cocoa powder, cinnamon, nutmeg and cayenne pepper, and water to a boil in a large pot over medium heat, stirring. Add vanilla and a pinch of salt. Remove from the heat; using a rubber spatula, stir in popcorn and 1 more cup of mini marshmallows. Now for the fun and sticky part – yes it will be sticky! Butter your hands, and shape mixture into balls. Roll formed balls in cinnamon sugar. Who said popcorn balls were boring!?! ENJOY! 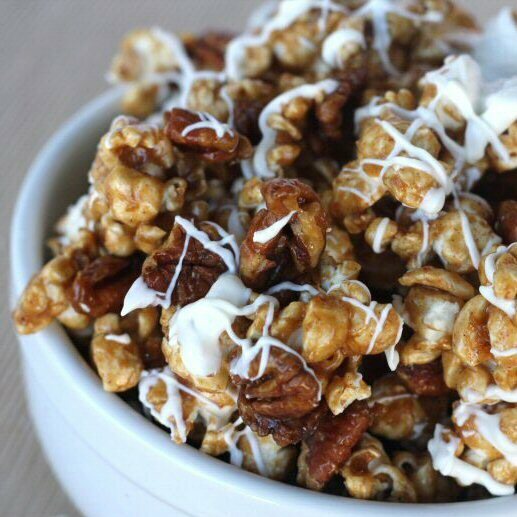 Popcorn is a great snack that is also a great canvas for flavors and textures. Thanks to Food Networks Pinterest page, I stumbled upon this Peanut Maple Popcorn recipe that I tweaked a just a little bit. This takes regular popcorn to another level. Movie night snacking gets a little bit sweeter with this tasty treat. Combine sugar and maple syrup in small saucepan. Cook over medium heat, stirring constantly, until mixture begins to boil. Remove from heat. Blend in peanut butter and vanilla. Place popped popcorn and peanuts in a large bowl. Pour peanut butter mixture over popcorn, stirring until coated. Place popcorn in a single layer on a foil-lined cookie sheet. Bake 10 minutes, stirring after 5 minutes. Remove from oven and cool. Betty Crocker is just wonderful. Most of us know this. I’ve always used Betty Crocker products and continue to because there is a great line of Betty Crocker Gluten Free products that those with gluten/wheat allergies need to have. If you aren’t a Betty Crocker member online you definitely should be – gluten free or not. It’s super easy and free! Anyways, here are some great recipes that you can use Betty Crocker Gluten Free Bisquick in. These recipes are quick, easy and delicious. So it’s a Bisquick day! Let’s get going! 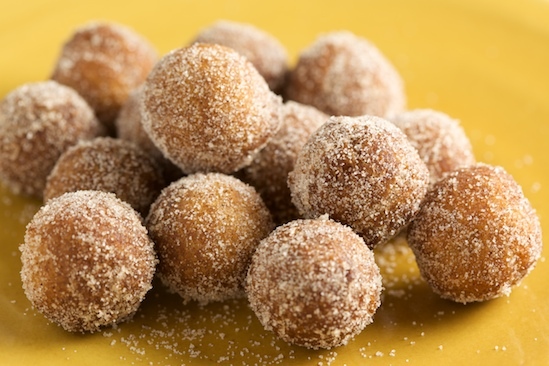 Rolled in cinnamon-sugar, these doughnut holes are a real breakfast treat! They’re easy to make with Bisquick Gluten Free mix. In deep fryer or 2-quart heavy saucepan, heat 2 to 3 inches oil to 375°F. In shallow bowl, mix granulated sugar and cinnamon; set aside. In medium bowl, mix remaining ingredients until smooth. Shape dough into 1 1/4-inch balls. Carefully drop balls, 5 or 6 at a time, into hot oil. Fry about 1 to 2 minutes or until golden brown on all sides; drain on paper towels. Immediately roll in cinnamon-sugar. Bite sized cinnamon sugar wonderfulness. Breakfast, dessert or a little snack just got a little sweeter. Heat oven to 400°F. Line cookie sheet with parchment paper. In medium bowl, stir Bisquick, pure vanilla extract, and 1/2 cup almond, coconut or rice milk until soft dough forms. Place dough on surface generously sprinkled with Bisquick mix; roll in Bisquick mix to coat. Knead 5 times. Press or roll dough into 11×8-inch rectangle. Spread dough with 1 tablespoon softened butter. In small bowl, mix granulated sugar, cinnamon, and optional walnuts; sprinkle over top of dough; press in slightly. Starting with an 11-inch side, roll up dough tightly; seal edge. Cut into 3/4-inch slices. Place slices on cookie sheet. Brush slices with 1 tablespoon melted butter. Meanwhile, in small bowl, mix glaze ingredients, adding coconut milk, 1 teaspoon at a time, until glaze is thin enough to drizzle. 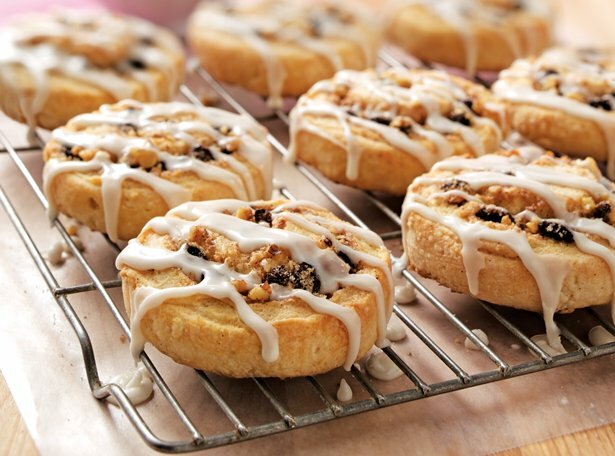 Drizzle glaze over warm pinwheels. Serve warm. A sweet bread with a apples and cinnamon. Always a winning combination! In deep fryer or 4-quart heavy saucepan, heat oil to 350°F. In large bowl, stir Bisquick mix, water, egg, granulated sugar and cinnamon. Fold in apple. Working in batches, drop batter by tablespoonfuls into hot oil. (Use a melon baller or small ice cream scoop for measuring the batter and dropping into the oil.) Cook 2 to 3 minutes, turning occasionally, or until golden brown. Use a metal slotted spoon to remove fritters from oil; drain on paper towels. 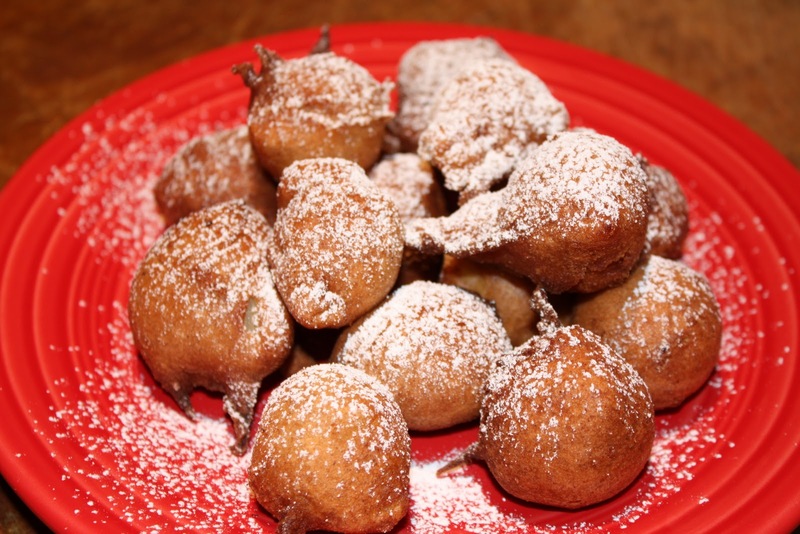 Before serving, sprinkle fritters with powdered sugar. Thank you Majorie Husted! 🙂 Where would baking be without you?! Kwegyirba Croffie is a freelance Associate Producer at News 12 Connecticut and a Special Events/Event Planning and Social Media Intern at College Lifestyles (TM). She is a Quinnipiac University alumni and a member of Alpha Delta Pi. She enjoy cupcakes, Forever 21 ,giraffes, peacock feathers, orchids, lillies and anything Disney.